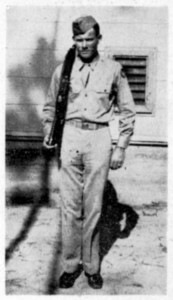 Isaac London Jr., in U.S.A. Army 244th AAF Base Unit at Keesler Field summer 1945. He was 18 then. bands, we waited and prayed and Isaac left us. And we came home. But we left with the hospital, and Dr. Huth, our full permission for them to next morning hold an autopsy on him, in the hope that possibly something might be learned about his kidney and liver conditions that would help in operating or treating some other boy, and save his life. wore to the dance here Dee. 21st when he was full of life, and hope and the joy of living. Again, I beg your patience in this rambling sketch or story. It is written in my room in the early morning hours of Wed­nesday. Friends and more flowers are coming in, over a hundred telegrams; and I shall end this by dressing and going hack into the parlor, again a look at my partner and son. Ike, and on and on. But Ike will remain fresh in our mem­ory, and ever dear in our hearts. A nice boy.